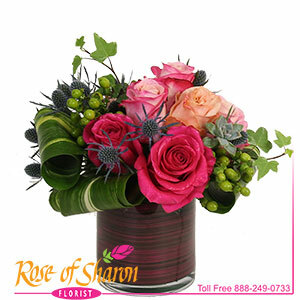 Rosabela is a beautiful assortement of 8 roses in tones of pink. Arranged in our heavy glass cylinder vase lined with coordinating faux aspidistra which hides the stems, this beautiful bouquet dazzles with texture and tone. See Rosana to change the container.